Now, an apology of this sort has some importance within the national dialogue, insofar as it’s a reminder that sexual assault is bad. That should go without saying in America, but considering the fact that we have a confessed groper in our highest office, it could stand a bit of emphasis now and again. Those who commit sexual assault should feel remorse, and the fact that they’re forced to apologize is a good lesson in public morality for everyone else. In that sense, the mere existence of the apology is beneficial. Woman: That apology is not good enough. Man: What else do you want? He took responsibility! Woman: I want x, y, and z. The man always comes off as the dolt in this scenario, and deservedly so, but they’re both making the same mistake. Namely, they are engaging with the idea that there exists some hypothetical apology which is sufficient. The problem with that is that some people, even sexual abusers, are smart. They can demonstrate contrition, they can flatter the outraged by co-opting their language, and they can manipulate through the appearance of growth. Someone will always write the perfect apology. By the standards laid out in recent months, Al Franken came pretty close to pulling it off. He took near-total responsibility for his actions, blamed himself, and went on to say that other victims should be believed. In the future, he said, he would be an ally. Al Franken is good at writing apologies. Al Franken feels true remorse for his actions, and will never do it again. Now, I’m not saying Franken isn’t fully reformed. Everything he said may be true, and he may be a model citizen from this day forward. The point is, I have no way of knowing, and neither do you. And until we can read his mind and see his future, we will never know. Because of that, the apology has no value as it pertains to Franken. Louis C.K. wrote a fairly decent apology, aside from the fact that he never used the words “apologize” or “sorry.” Harvey Weinstein and Kevin Spacey wrote terrible apologies, in which they cynically tried to exploit hot-button liberal causes (hatred of the NRA, tolerance for homosexuality, respectively) to wriggle their way out of trouble. Roy Moore didn’t apologize at all. On the individual level, none of it matters. The public apology is theater. Louis C.K. 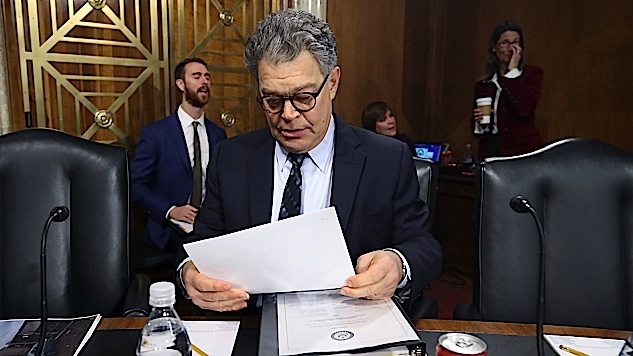 is a better performer than Weinstein, and Franken is better than Louis C.K. In every case, the apologies they wrote are just words, and words are empty in the face of deeds. That’s the only way to judge these men—their actions. It’s the only concrete evidence we have of how they behaved in the past, and therefore it’s the only factor on which we should base our judgment. If your feelings toward Franken are mitigated by the strength of his apology, you have fallen for an act. You are placing him higher on the hierarchy of accused sexual abusers merely because he was more clever in his PR campaign. You are granting arbitrary value to a confession that occurred after the man was caught. You are being duped. Public apologies are useful because they set an example for the future. But they are useless when judging the repentance of the apologist. Stop participating in a meaningless debate. Stop assuming that good writing and a keen sense of the zeitgeist are any indication of a person’s true remorse. Stop detracting attention from the crime of sexual assault, and the important dialogue of how to prevent it in the future. Start thinking critically about the difference between what people say, and what people do.